The VW Touran rose to the No. 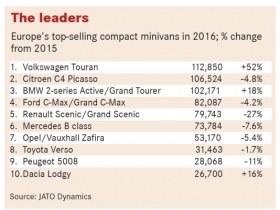 1 spot in Europe's compact minivan segment with a 52% sales increase last year. 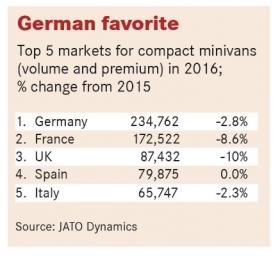 LONDON -- Europe's compact minivan segment is forecast to continually decline until 2020 because of rising demand for SUVs and crossovers. The overall annual volume for models such as the Volkswagen Touran and Renault Scenic is expected to slip below 500,000 in 2020 from 644,300 last year, according to LMC Automotive, which also predicts flat sales of about 167,000 a year for premium models in the sector during the rest of the decade. Last year, total sales in the segment dropped by 4.4 percent to 820,3000, with volume models decreasing almost 7 percent. Sales of premium compact minivans, led by BMW's 2-series Active and Grand Tourer, grew in 2016, but they lost ground in the first two months of this year, according to data from JATO Dynamics. Sales are on the decline because automakers are either replacing their compact minivans with SUVs or launching SUVs that offer much of the flexibility and practicality typically found in their minivans. "The popularity of the compact SUV is their main threat," JATO Dynamics global analyst Felipe Munoz said. That popularity is well illustrated by what has happened at Peugeot. The French automaker replaced its 3008 minivan with a SUV-styled successor that uses the same name in late 2016. Peugeot sold twice as many 3008s in the first two months of the year and its volume of 21,431 units was better than Europe's biggest-selling minivan, the VW Touran, during that time frame, according to JATO data. 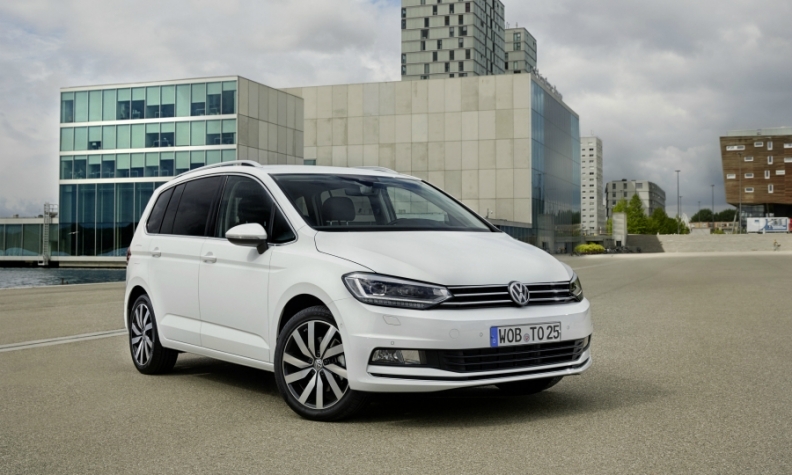 In 2016, the Touran was the dominant compact minivan in Europe. Sales of the model, which was replaced in 2015, rose 52 percent last year to 112,850 units. The Touran's sales, however, have slowed as its two-month volume was down 8 percent. The minivan, which is available with seven seats, will come under further pressure when the seven-seat Allspace version of the Tiguan compact SUV goes on sale later this year. VW's UK brand director, Alison Jones, admitted that the Allspace would poach some customers from the Touran, but she believes the minivan remains a key model. "We still see a solid place for Touran in our sales," Jones said. Several automakers have a different view: Mazda, Seat, Fiat, Honda and Skoda have all left the segment. Skoda's replacement was the seven-seat Kodiaq SUV. 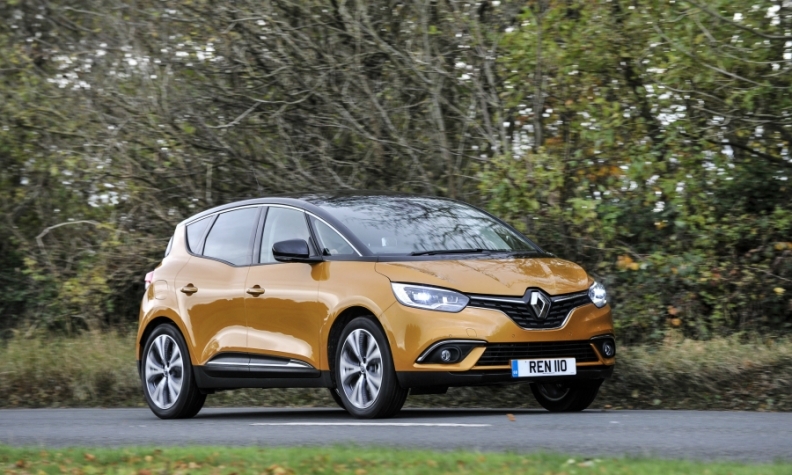 The new Renault Scenic has more ground clearance and is wider than its predecessor. Even Renault, which created the modern compact minivan segment in 1996 with the Scenic, has been forced to adapt. Last year it tried a new approach with the fourth-generation Scenic. Instead of focusing entirely on practicality, Renault chief designer Laurens van den Acker went for a more emotional design. "It is a sexier and more modern take" on the minivan, he said at the car's launch last year. It was a repeat of a technique Renault used when it debuted a new, more SUV-like version of the Espace large minivan in 2015. "It [the Espace] became a little less functional but a lot more attractive and this hasn't chased away clients as much as we feared," van den Acker told Automotive News Europe. The new five-seat Scenic and seven-seat Grand Scenic are closely related to the Kadjar compact SUV, which has resulted in higher ground clearance and greater width than before. "On paper they're the same car, if you compare spreadsheets," van den Acker said. The new Scenic will also be one of the first production cars in Europe to offer a 48-volt hybrid drive. Sourced from Continental and Schaeffler and mated to Renault’s 1.6-liter diesel, the 48-volt system cuts carbon dioxide output to 92 grams per kilometer compared to 100g/km for the equivalent diesel without it. Renault will roll out variants of the Scenic with the system in Europe later this year. Despite the changes, the Scenic has yet to make a big leap in the segment. Through two months, European sales were up 4.7 percent to 12,224, putting it just ahead of Ford's C-Max range but it still trails the older Citroen Picasso family, according to JATO figures. "Renault's attempt at a more aggressive 'SUV wannabe' Scenic hasn't had much effect," JATO's Munoz said. 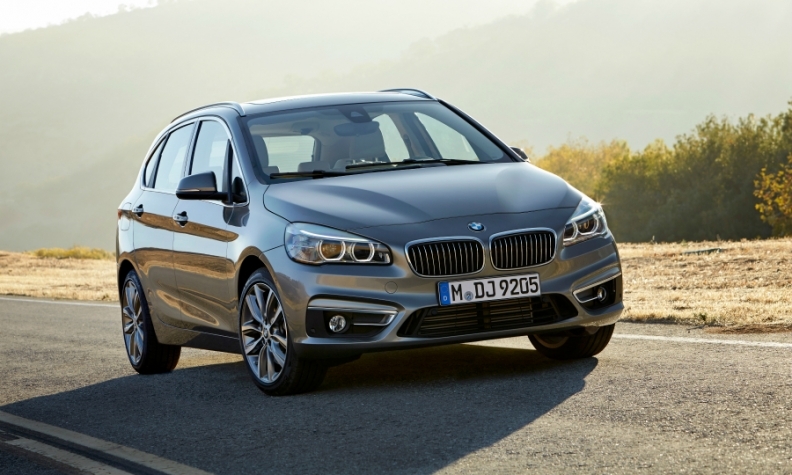 The BMW 2 series was Europe's top-selling premium compact minivan and ranked third overall with a volume of more than 100,000 units last year. France was Europe's top minivan market in terms of total share in 2016 with 8.6 percent, but that had fallen to 7.3 percent in the first two months of this year after sales dropped 16 percent. Of the top 10 European markets for this segment, seven saw double-digit percentage decreases in the first two months, with fourth-placed Spain dropping 23 percent, according to JATO figures. Last year, Germany was the biggest market for overall sales and remained No. 1 in the first two months of this year. Germany was helped by sales of locally made models such as the Touran, 2 series, Mercedes B-class and Opel Zafira. Opel says it will continue to build the Zafira despite announcing it will launch the Grandland X compact SUV at the beginning of 2018 on the same platform as the hot-selling Peugeot 3008. JATO, however, predicts the German automaker will eventually drop the Zafira from its portfolio. By 2020, Opel aims to have four SUVs, which could give it the confidence to leave the compact minivan sector despite the success it has brought the brand since launching the original Zafira in 1999.